The Canada Revenue Agency says its online systems have been restored after being down for most of the day. The Canada Revenue Agency (CRA) says its online systems have been restored after being down for most of the day. "The computer hardware issue has been fixed and our online services are up and running. Thanks for your patience," the CRA said in a tweet post at 5.35 p.m. ET. On Monday morning, officials said they were looking into "technical issues" that shut down both the "My Account" and "My Business Account" log-in pages. Other services, including changing personal information and NETFILE, the system where users can actually file their taxes online, were unavailable. The CRA apologized for the interruption of service and said it was "temporary." "We're working with Shared Services Canada and its partners to resolve this issue as quickly as possible. We will update Canadians when the problem is resolved," CRA spokesperson Dany Morin told CBC News. 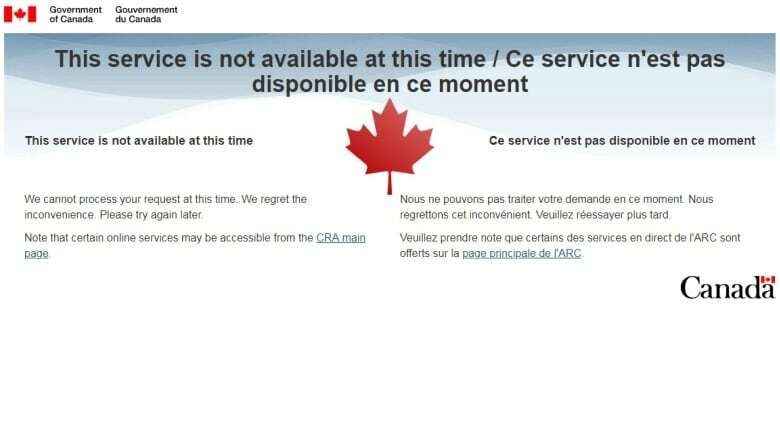 Some Twitter users said the CRA's services appeared to have been down since Sunday night. The CRA's website is used heavily at this time of year for Canadians filing their taxes.